America! Our home for the next six weeks. Actually, just Florida but there are worse places to be this time of year and we are pretty happy to be escaping the winter for some warmer weather. Well, the locals are complaining that it's too cold and are all walking around in winter clothes even though it's 18 degrees. Meanwhile, we are just wearing shorts, t-shirts and flip-flops. 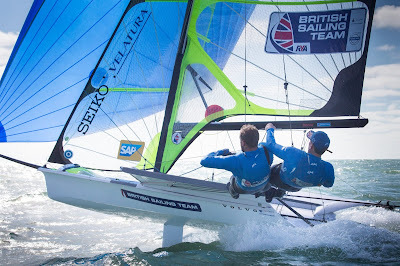 The reason for our stay is to get some solid training in ahead of the next Sailing World Championships, which are in Clearwater in a few weeks. Its unusual to have two Worlds so close to one another so we have had to change our normal yearly programme. Instead of having a quiet winter somewhere in Europe, we are now enjoying some warmer weather. We spent 10 days in Clearwater at the start of January to get to grips with the Worlds venue, something we didn't think we did well enough at the last Worlds. The training was great out there; big waves, a good breeze and, most importantly, some very productive training. It was a small group of seven boats in total but it was exactly what we needed and we came away feeling fast and sharp. Next, it was time for a wee holiday and rest before we got back into it, this time over in Miami ahead of the World Cup. It’s the first World Cup event of 2016 and this is the time now to really start pulling out all the stops. Put all those years, days and hours of time in to practise and show what we can do. We have had some great training recently, in fact, it’s been the best training we have ever done - the improvements have been big and we feel sharp. All that’s left now is to go racing!